Or should I rather say metallics for fall? Both versions should be adequate as I really fell for these brown fall metallics like the amazing "Pearly Chocolate Noir" (could the name be any more suitable?) by Kiko which I already bought back in Italy last month. However I'm already looking forward to revive some other metallic favourites, too especially the perfect bronze shade "Bangkok" by Mavala. Can you imagine I had already forgotten about this amazing shade? 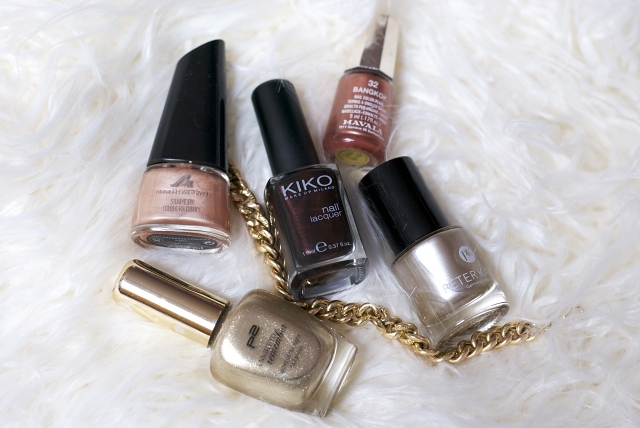 I was so happy when I found it at the Kiko store in Rimini and I knew it would be my favourite nail polish this fall. I just wish the pictures would show the shimmer a bit better as its red undertone makes the nail polish really special. Have you figured out your ideal fall manicure yet? Which colours do you like to wear on your nails when it's getting colder outside? Oooo I love. I really need a dark shade for fall don't I. The Kiko polish is fab! In this period I have to admit that I'm quite obsessed with glitter and metallic nails! Tolle Nagellack Farben für den Herbst! Oh, I like the colour that you're wearing. Really classy and perfect for autumn! Yes, I would definitely love to have another photo shoot with you. Perhaps after our blogger meeting? awesome color for fall! love the metallic reflexes! Beautiful shade and your photos are very pretty.